Sift together the flour, baking powder, salt, ground coriander, and ground cumin in a medium bowl. Add egg, lemon juice and water. Stir vigorously until smooth. Add the corn and onions. Stir until mixed well. Heat a large frying pan on medium high heat. Add enough oil to generously coat the bottom of the pan. Fill the pan about an inch deep of oil. When oil is hot, spoon about 2 heaping tablespoons worth of fritter batter into the pan to form one fritter, patting it down with the back of the spoon as soon as it is in the pan. Work in batches. Leave about 1/2 inch between the fritters in the pan. 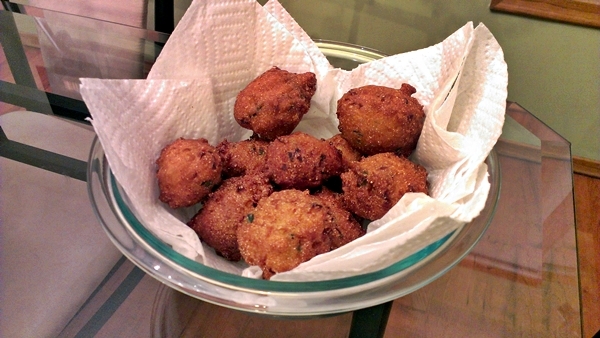 Let cook about 2-3 minutes on each side, flipping the fritters when they are nicely browned on one side. 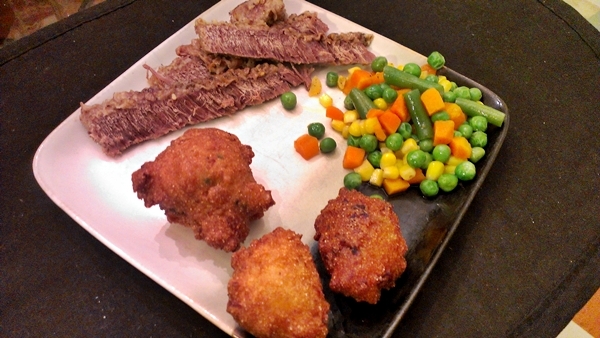 When browned on the other side, remove the fritters to a plate lined with paper towels to drain the excess oil. Combine all of the sauce ingredients into a small saucepan. Cook on medium heat, stirring until sugar dissolves. Increase the heat to medium high, let boil for 5-10 minutes or so, until the mixture becomes somewhat syrupy. Remove from heat and let cool. The sauce should continue to thicken as it cools. If it becomes too thick, you can add a little water to it to thin it out a bit. Last night we had this for dinner. The husband and I always like chipotle stuff, so I had already planned on this being good. And it was. I added an extra tablespoon on the adobo pepper sauce to make it a little hotter, cuz that’s how we like it. 😉 I served it on a bed of white rice and with the corn fritters and sweet chili sauce I made. Preheat oven to 375 degrees F . Roast the chicken in foil covered baking dish in preheated oven until cooked through, about 30 minutes. While the chicken iscooking, puree the milk, sour cream, chipotle peppers, and chicken bouillon granules in a blender until smooth. Melt the margarine in a large pan over medium heat. Pour in the chipotle puree, bring to a simmer, reduce heat to low, and season with salt to taste. Add the cooked chicken, and simmer for about 20 minutes, until chicken has taken on the flavor of the sauce. I made these the other night and I wasn’t really expecting them to be that great. I don’t usually like any kind of skewered meat. But this was really pretty good. 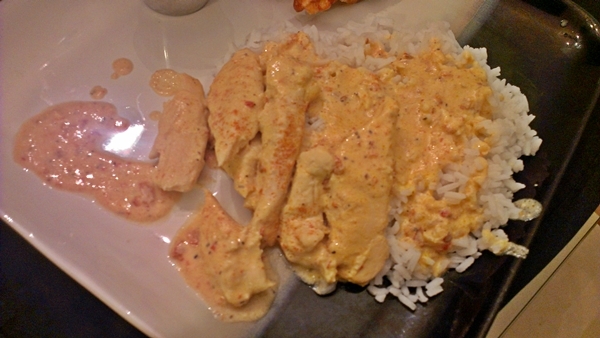 The combined flavors of the chicken and the peanut sauce was awesome. I served them with white rice and steamed peas. Heat vegetable oil in a saucepan over medium heat, and saute onion and garlic until lightly browned. Mix in water, peanut butter, soy sauce, and sugar. Cook and stir until well blended. Remove from heat, mix in lemon juice, and set aside. In a bowl, mix soy sauce, tomato sauce, peanut oil, garlic, black pepper, and cumin. 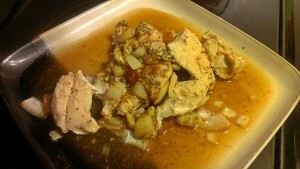 Place chicken into the mixture, and stir to coat. Cover, and marinate in the refrigerator for at least 15 – 30 minutes. 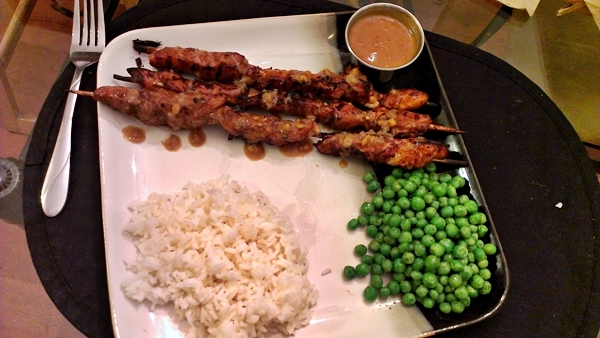 Thread chicken onto skewers. 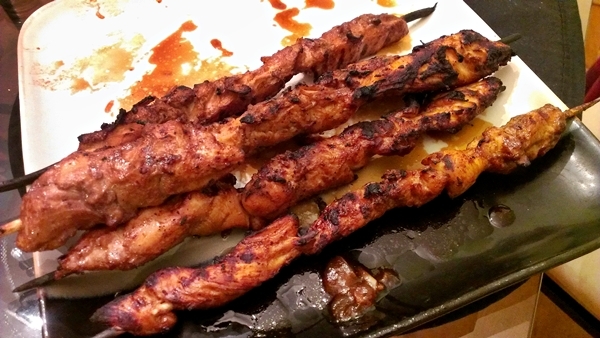 Grill skewers about 5 minutes per side, until chicken juices run clear. 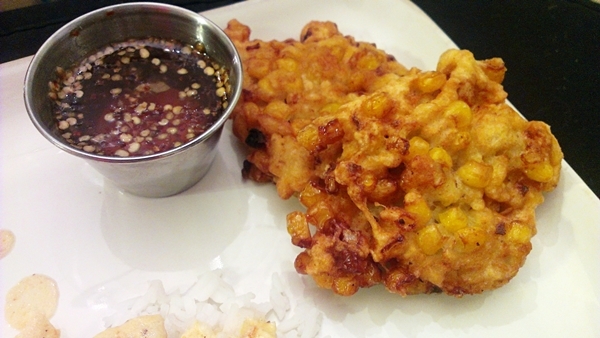 Serve with peanut sauce. 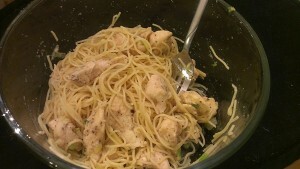 I tried this recipe out last week and it was yummmmmy. I’d never had these jalapeno kettle chips before. And now I like them. I figured they would be good because I like things with a bit of a bite to them. I still hate breading things though, it’s super awful and messy, but totally worth it because it always turns out super tasty. The jalapeno ranch dip I made was super good as well. 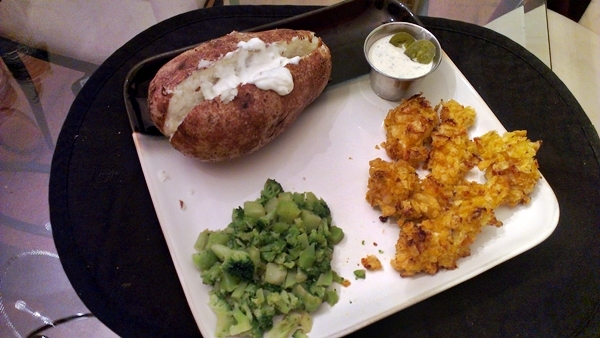 I served the chicken with baked potatoes and seasoned, steamed broccoli. Yum. Preheat oven to 375º. In a bowl, whisk together buttermilk, salt, and cayenne. 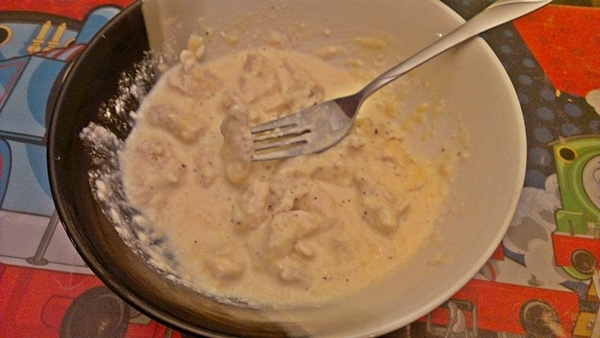 Pound out, or cut chicken breasts to roughly 1/2″ thickness and add to buttermilk mixture (coat well). Place crushed Kettle chips in a shallow baking dish.One piece of chicken at a time, take out of the buttermilk and gently shake to remove some of the excess. Dip into the chips and coat thoroughly on both sides. Place on baking sheet. Place into oven and bake for about 35 minutes, until cooked through. Mix the flour and garlic powder together in a shallow dish. Season with salt and pepper to taste. Dip the steak in the flour mixture evenly coating both sides. Set aside. Discard remaining flour mixture. Heat the cooking oil in a skillet over medium heat. Place the steak in the skillet and cook until browned on both sides, about 5 minutes each side. Stir in the chicken broth, lemon juice, garlic, scallion and spices. Bring the mixture to a boil over medium-high heat, then reduce heat to low. Cover, and simmer until steak is tender, about 1 1/2 hours. To serve, remove steak from the skillet, and slice across the grain in thin strips. Place on serving plates, and ladle sauce over meat. Mix together all dry ingredients. Then mix in the egg, buttermilk, onions and jalapenos. Batter should be thick. In batches, cook tablespoon-sized balls in 350 degree oil, until crisp and golden brown, turning every so often so they’re evenly cooked. (about 4-5 minutes). Remove to paper towels, serve! *Note* I used a medium sauce pan about 1/2 – 3/4 full of vegetable oil. Just don’t fill the pan too close to the top or it will bubble and splatter all over. Messes are never fun. Preheat an oven to 400 degrees. Butter a baking dish. 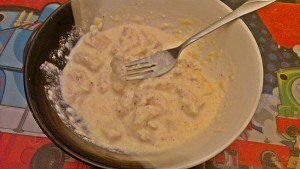 Whisk the sour cream, Dijon mustard, garlic, and pepper together in a large bowl. Add the chicken and turn to assure the breasts are well coated. 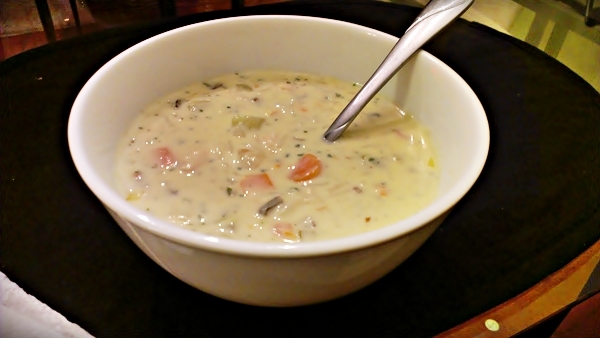 Refrigerate 20 to 30 minutes.Combine the cornflakes and onion soup mix in a bowl. 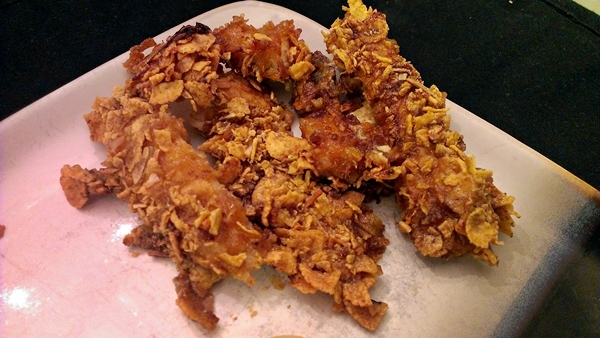 Gently press the chicken breasts into the cornflakes mixture to coat and shake off any excess. Lie the coated breasts in the buttered baking dish. Drizzle the melted butter over the chicken. 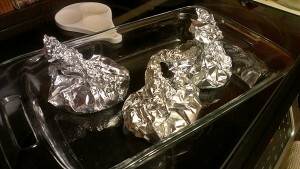 Bake in the preheated oven until the chicken is golden brown, 20 to 25 minutes.